HF3470 Vs HF3485 - What's the Difference? 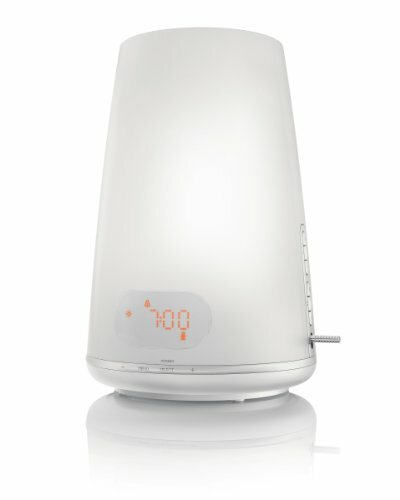 Are you interested in buying a Philips Wake-Up light, however are unsure as to which model to go for -- either the HF3470 or the HF3485 (aka wake-up light plus) -- if so, then this guide which compares & contrasts both the features and specifications of the two models should be able to help you out. Ultimately allowing to get a clearer view as to what both wake-up lights can offer you and which one out of the two offers the best value for you specifically relative to its respective price tag. With the lights being independently clinically proved (as well as being officially endorsed by the National Sleep Foundation, along with hundreds of customers) -- to offer numerous benefits to users such as helping them to get out of bed on a morning as well as generally increasing energy levels & alertness throughout the day. Essentially revolutionizing the way we approach our sleeping routines. As you may know, they essentially replicate a 'sun-rise effect' (through starting with warmish reds to eventually bold yellows, covering over 20 light level settings) from 30 minutes of the set (natural) alarm noise time -- which falls on your eyes, which instructs the brain to release cortisol (a sort of energy level hormone, this is why you feel so much better after waking). Allowing you to awaken more gradually, more naturally. Which compared to the standard way of waking ourselves through literally shocking our body into a panic of stress (with a screeching alarm clock), is obviously much a healthier and just simply more logical method of going about it. Starting with what aspects are shared & are identical with the HF3470 & HF3485 -- they obviously share the same modern, sleek looking and practical (e.g. anti-slip rubber feet) design and integrated usage of an FM radio (although you get three pre-set stations with the HF3485) & of course utilises the 20 light intensity levels to replicate sun sets etc. to allowing 'gradual' wake ups and to increase alterness (although the period of time is set at 30 mins for the HF3470, it can be adjusted for the HF3485 in between 20 and 40 minutes with which you can experiment to get your most optimal outcome). They also both feature a 'easy-pressed' snooze button to allow you 9 minutes of extra sleep. The HF3485 is however a more advanced model & it is the 'upgrades' where the differences lies between the two wake-up lights -- the main one being its 'dusk-setting' feature (essentially the reverse of the sun-set effect mentioned above), with 15 min, 3 min, 60 min and 90 min adjustable options) that has been proven to help users get to sleep easier. You also get two separate alarm times, which is beneficial if you sleep with a partner who wants to share it too. 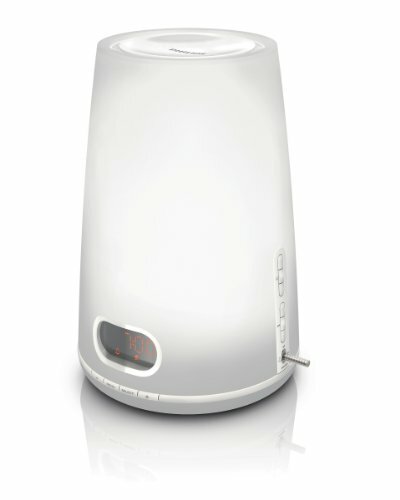 The HF3485 model also comes with an extra 2 natural wake up sounds (4 in total, compared to just two with the HF3470). Moreover, you can actually customise your own sounds through the USB slot provided (taking MP3 & WMA formats). With regards to the warranty covered for both models, when bought new they are backed by a 24 month coverage plan -- which basically includes both your parts & labour costs. They are of course certified as safe to use too hence are UV (ultra violet) free etc. The bulbs won't need replacing anytime soon either, with them being fitted with a Philips Halogen Lamp (100W, 12V, code: GY6.35) which is expected to last you around 20 years (which is about 4,000 plus hours of continuous usage). Conclusion: Should I Buy a HF3470 or HF3485? As you have seen the HF3485 model is basically just an upgrade to that of the HF3470 and would only recommend you to choose that model over the other if you have particular difficulties with 'the falling' to sleep aspect or intend to share it with your partner. Obviously, compared to standard digital clocks, these wake-up lights are rather expensive -- however the benefits they offer (which I deem to be pretty much invaluable): you can get up easier, feel better and have increased energy levels -- makes them pretty much a bargain. Also, let me know which model you choose to go for and why? Furthermore, if you have any queries, comments or concerns regarding either the comparison article of the HF3470 vs HF3485 or about either model specifically then please do not hesitate to make them in the comments section just below and we will be sure to respond to you as soon as possible.